Get some pork on your fork. 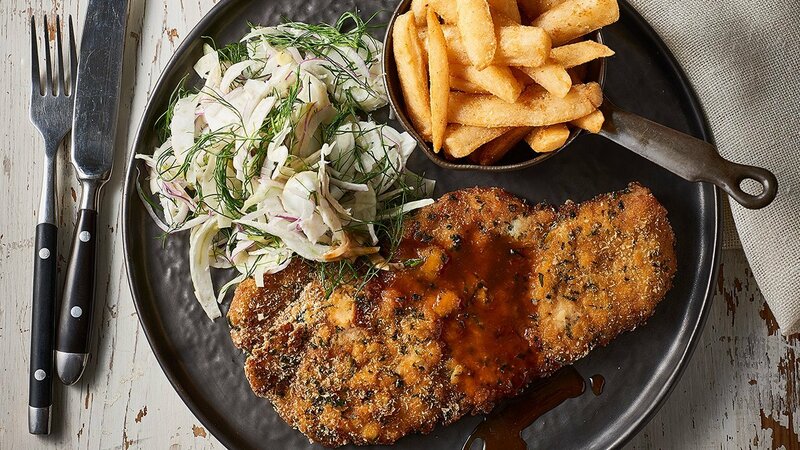 Schnitzel is popular across pub and clubs but usually made with chicken. This schnitzel gives a modern edge to a classic. Trim pork fillets into 100g portions and tenderise using a meat mallet. Set out three half gastronome trays, add flour to the first one, whisk eggs, wasabi paste and milk in the second and place the KNORR Potato Flakes GF and cilantro in the third. Take each piece of pork and coat it in the flour mix, followed by the egg wash finished with the Flake mix. Once coated set aside ready to fry. Repeat with each piece. Set aside until needed. In a bowl mix the HELLMANN'S Real Mayonnaise through the fennel and onion. Take a pot and bring the water to the boil. Add in the wasabi and whisk. Reduce to a simmer and whisk in the KNORR Jus. Keep hot for service. Fry the schnitzel in the deep fryer deep fryer until cooked and golden brown. Add a side of salad and wasabi jus.